We’re halfway through the year, it’s cold outside and everyone’s all been working hard – it’s no surprise that your team is looking a little tired and worn out! Here are some tips from the specialists at our teambuilding venue near Pretoria on how a fun teambuilding event will help your employees get their mojo back. At Idle Winds, our venue staff develops and facilitates fully customisable team building packages that are created to meet your company’s specific requirements. Just 14kms from Fourways, we are an easy drive for businesses in Sandton, Johannesburg and Pretoria. We can also accommodate you and your team on-site in our comfortable accommodation consisting of 58 double and twin-sized rooms if you would prefer a weekend retreat. 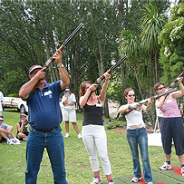 For more information about our team building venue near Pretoria and the packages we offer, please contact us today.